I found this beautiful pond in Penticton, BC during the summer. The owner took great delight in it. She visited it every morning just to set herself up for the day. I found it to be a most restful place with the Koi Carp swimming under the surface, the colours of the water lilies and the gentle trickle of water falling across the rocks. Here’s to those wonderful summer days again in Penticton. Want to join me? This entry was posted in Canada, Photos and tagged Bridge, Gardens, Penticton, Photograph, Summer, Water lilies, Weekly Photo Challenge. Bookmark the permalink. Thank you. It was the most wonderful place to be on a very hot summer afternoon. It is. Right on the side of a mountain with the most wonderful views. It makes me want to walk across that bridge and sit in the middle and listen to the birds and sounds of nature. It was a wonderful place, right on the side of a mountain. A lot of work had gone into creating it, and it was worth it. Hi there. Thanks for commenting. The pond is an amazing place. I should probably try and photograph it in winter to give a comparison. I agree with the colours. The wooden bridge, created from a fallen tree on the property, is wonderful. Thank you. So glad you stopped by. I enjoyed your contribution of the mountain and lake scenery too. It’s like that monet picture! Yeh, I thought that too! 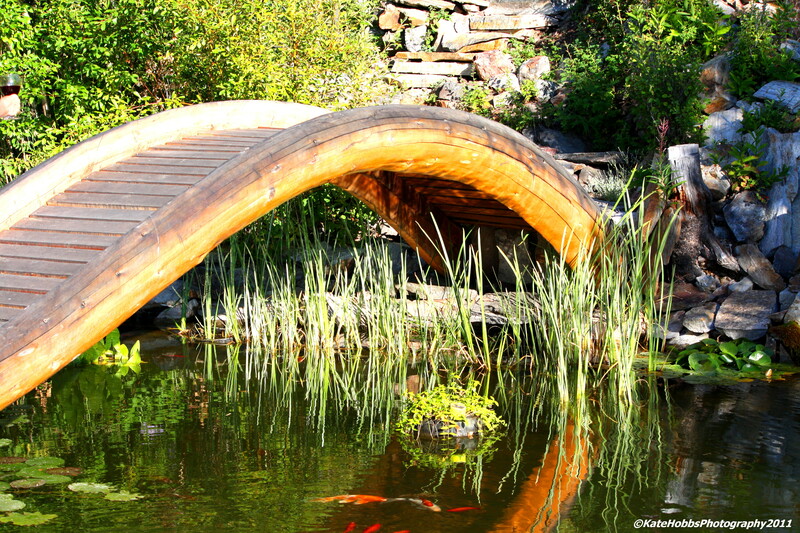 Bridge, water and water lilies!!! I can feel the peace. Beautiful work. Thank you. I’ve really enjoyed this week’s challenge. I wonder what the next challenge will be? It’s early in my challenge but I’m pressing in on this one. Peaceful, definitely 🙂 I love your interpretation. Thanks for the share! This was the only photo, of several, that had the carp showing. Their colour does add to the photograph. Where on earth did I get Sarah from. I’m so sorry Pseu. That is a spectacular shot, Kate! Oh, to have a water pond like that – that would be a great way to start the day, sitting there, gazing at the water trickling and fish swimming, while sipping on hot coffee. Even a great way to end the day. Imagine dusk, the sunsetting, and a cup of hot tea. 😉 Great capture! The location of this pond gets the setting sun. It is really spectacular, and the owners/creators do exactly what you have described, each morning and evening. What a way to be at peace.